Figure 10 Caliceal diverticulum. 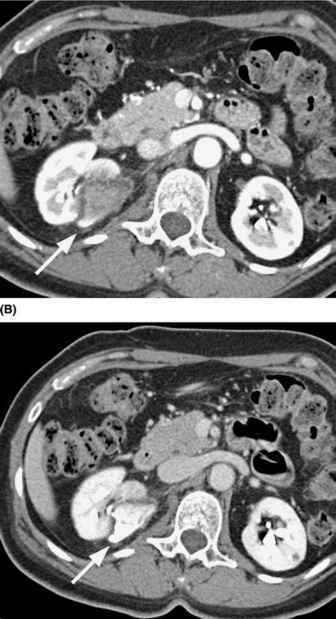 (A) Excretory-phase axial image demonstrates a urine-contrast level in a mass in the upper pole of the right kidney (arrow). This mass had uniform water attenuation on the precontrast images. Based upon these findings, a diagnosis of caliceal diverticulum can be made. (B) This large caliceal diverticulum is also easily seen on the coronal volume-rendered 3-D reconstruction (arrow). 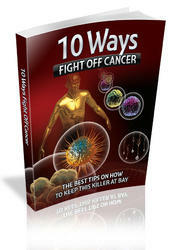 Bladder cancers may also produce small mural nodules. These can be detected by CTU even when quite small (again, often best and occasionally only seen with wide-window image viewing) (Fig. 13). 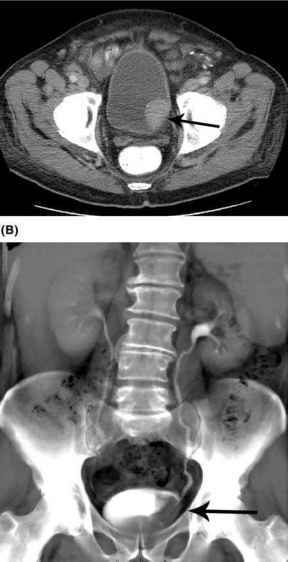 Figure 11 Ureteritis cystica. (A) Multiple tiny mural filling defects are easily seen in the distal right ureter (arrow), which is crossing over into the left lower quadrant on this coronal volume-rendered image in a patient with a left-sided ileal loop urinary diversion. Similar findings are present in the mid and distal portions of the left ureter. 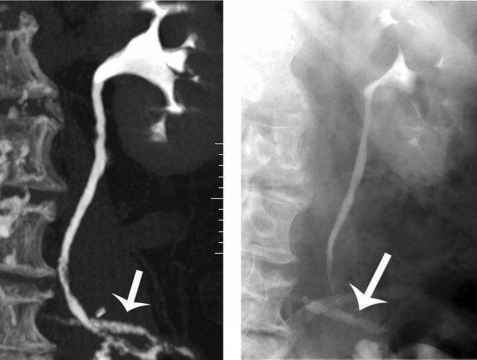 (B) These findings are less apparent (arrow) on this left posterior oblique abdominal radiograph taken during an excretory urogram, which preceded the CT by several months. Abbreviation: CT, computed tomography. thickening had bladder cancer, while bladder cancer was the cause of wall thickening in only one of ten patients when such thickening was symmetric and diffuse. Although bladder hematomas can have an appearance similar to that of bladder neoplasms (Fig. 14), they can occasionally be identified correctly when they have characteristic high attenuation (60-80 Hounsfield Units) on precontrast scans. Sometimes, the cause of hemorrhage (which is often a bladder neoplasm, cystitis, or upper-tract bleeding) can also be identified. As mentioned above, cystitis frequently causes uniform diffuse bladder wall thickening (Fig. 15). In many instances, cystitis can be suggested on CTU (when such thickening is visualized); however, false negative studies are occasionally encountered (because urothelial inflammation need not produce detectable wall thickening). Figure 12 Large bladder cancer. (A) Nephrographic-phase axial image shows a large enhancing mass in the left posterolateral aspect of the urinary bladder (arrow). Mild diffuse bladder wall thickening is noted elsewhere. (B) The mass is also easily seen on the coronal average-intensity projection-reconstructed image (arrow). What is Irregular thickening of posterior wall of UB? What is focal mural thickness of bladder?